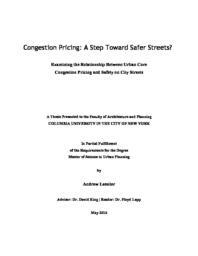 This thesis explores cordon-style urban core congestion pricing as a street safety mechanism. With a handful of cities around the world having implemented different versions of cordon-style pricing, and conversations about street safety growing through the increasing adoption of Vision Zero in the United States and Europe, is there a nexus between these two policies? This research examines case studies of congestion pricing in London, Stockholm and New York; and assesses the relationship, both real and perceived, that is present in each city and in the literature between pricing and safety. It finds that safety is largely absent from the discourse of congestion pricing. But the presence of academic literature demonstrating significant safety benefits from pricing, as well as an understanding among some media and planning professionals that congestion pricing can be implemented in pursuance of safety ends, presents the opportunity for a variety of policy and implementation strategies that could move transportation policy frameworks simultaneously in the direction of both congestion pricing and street safety. This thesis concludes by proposing that safety be integrated into the discourse of congestion pricing, and that congestion pricing be considered for implementation as a Vision Zero policy.